Large Roomy Home Sleeps up to ten guests. Two Bedrooms in the Main house have 1 King bed and 2 Twins. The Casita has 1 Full Bed. In addition there are 2 Twin Sofa beds & 1 full Sofa bed. Aside from being able to accommodate a larger group this home has many interesting features: First and foremost are the breathtaking Red Rock views that can enjoyed from the property. Structurally, the home's style combines old Spanish Mission with a contemporary twist. Inside beautiful wood features, arched windows, a unique fireplace and Saltillo tile compliment the architecture. The window coverings, wall paper and furnishings are a mix of contemporary, country and southwest that work very well together. The property sits on 3/4 of an acre affording a sense of privacy and seclusion. 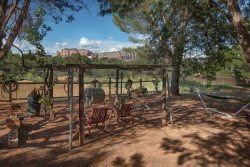 The location of this home is mid way between Uptown Sedona and the Village of Oak Creek making it assessable to Hiking Trails, Restaurant, Shops and Galleries in both areas. This is wonderful Vacation home for any size group! PLEASE BE AWARE: The Casita may require auxiliary cooling/heating and that portable fans/heaters are available for use if necessary. Also this property does sit next to a cemetery. The Foothills team is first class! I have worked with Kim and Cherry in the office. They are welcoming, friendly and efficient. I appreciate the fact that if they do not have an answer at hand they will say so and go and find the answer. The handyman, Anthony, is very pleasant, very polite and very efficient. When he had to come to the property to make repairs he called first, arrived on time, and completed the work with a minimum of fuss. We had a lovely time. The property is private; it has beautiful views, and is quite except for the birds and the coyotes. We will choose it again. The place is well furnished, nicely laid out to accommodate a large group. Has great views, nice decks, and is very centrally located. It was also well priced. However, it is dark and needs to be updated or renovated. Everyone was very helpful and friendly and concerned about our satisfaction. We were there for a family reunion but didn't really take the holiday weekend into consideration so the town was very crowded and traffic was horrendous so we pretty much just stayed at the house and visited which was just fine with us and the house certainly lent itself to that with the large dining room, family room and kitchen all together with plenty of seating and natural light. Everyone was very friendly and helpful. Thanks! We love the location and privacy. We have booked again for next year.